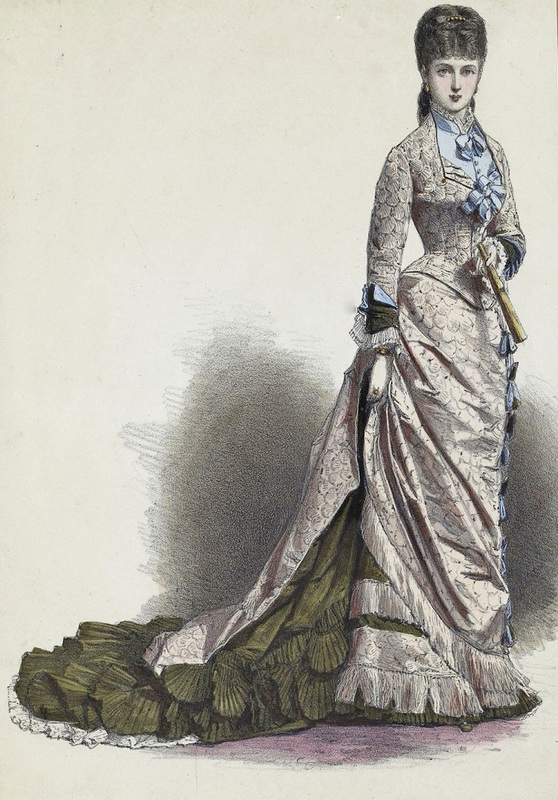 Unheard of in modern times, the balayeuse was a common element of the Victorian woman’s wardrobe. But what exactly is a balayeuse? How does it work? And more importantly—how can you create one? When you have a new trained gown, you can easily picture it trailing behind you as you make a grand entrance. You also might cringe at the thought of yards of perfect silk taffeta tumbling behind you on the dusty floor. The Victorians also had this problem. Trained skirts were popular during much of the mid- to late-1800s; the streets were filthy and fashion editors complained bitterly about skirts dragging in the mud. What’s a girl to do? One option is to lift your train up. They sold little devices that did just this. Called a skirt elevator, it clipped onto the fabric and, by means of a chain or cord, could be raised to temporarily lift your train, such as while crossing the road. If you prefer to leave your skirt up, you can bustle it. This generally involves a sturdy loop and a reinforced button upon which to fasten it. Bustling can look pretty, but is not easily done up or taken down. Besides, why go to the trouble of making a trained gown if you’re just going to leave it bustled up all the time? Some ladies sew a long loop of ribbon to their trains, and thus suspend their skirts from their wrists, especially while dancing. But this quickly grows tiring and it risks damaging delicate fabrics. 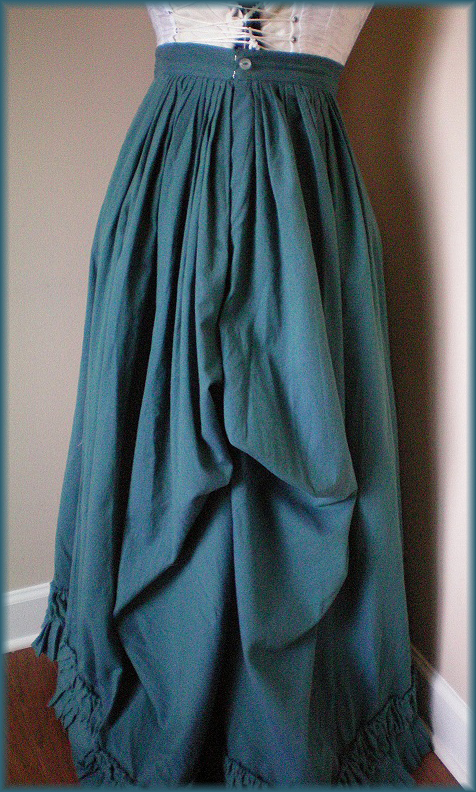 A lesser-known option is to allow your skirt to flow gracefully behind you, confidant in the knowledge that your balayeuse is keeping your gown clean. A literal translation of the French word is “sweeper”. Another term for it is dust ruffle. Basically, it’s a layered flounce that fastens to the underside of your train for the purpose of keeping your skirt up off the ground. A balayeuse serves a double purpose. First, it drags on the ground beneath your dress, collecting dust and debris. This may sound disturbing, but it saves your gown from being soiled by that very same rubbish. In addition, some balayeuses add support to your train, keeping it full and spread out, instead of crumpling on itself as trains tend to do. There are two basic styles of balayeuse. 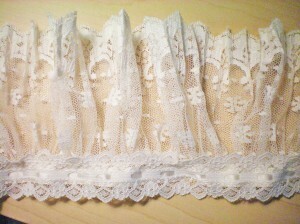 The first is a simple ruffle, which may be edged with lace. The flounce may be gathered or pleated, and it may consist of one or two tiers. The less common option is a wide, shaped panel that is layered with ruffles and/or lace and mounted upon the lining on the underside of the skirt’s train. According to Harper’s Bazar and other sources, the balayeuse could be worn in lieu of a trained petticoat. The petticoat would serve much the same purpose of adding support to the train and dusting the ground to keep the gown’s train clean. A petticoat, however, would be heavier and more difficult to clean. You might also add a balayeuse to your trained petticoat. I haven’t found any historic examples of this, but it makes sense if you’re using a trained petticoat that would be difficult to wash.
Just because it has a dirty job doesn’t mean a dust ruffle has to be utilitarian. In the Kyoto Fashion Institute there is an example of a fine lace balayeuse on a couture gown created by Charles Frederick Worth. 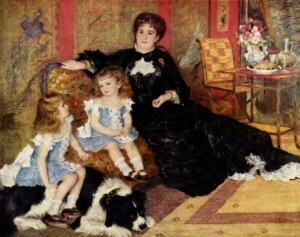 Balayeuses can be made of your dress fabric, sheer muslin and lace, more basic broadcloth, or even pre-gathered eyelet. Almost anything will work so long as it’s ruffled and easily removed. Now that we know what a balayeuse is, how do we make one? Let’s begin with the simplest kind. First, choose your materials. According to historic sources, the most popular balayeuses were either white or black, or made of your dress fabric. The benefits of black are obvious: it will hide a multitude of soiling, which, given the purpose of a balayeuse, is a definite plus. If you want to be practical, or if you’re portraying a citizen who must consider utility above all else, choose black. White, on the other hand, is pure and definitely for the upper-classes. It shows the slightest stain, which means it must either be washed or replaced frequently—and that suggests wealth. 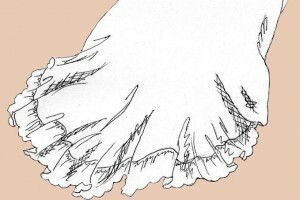 Also, most undergarments are white, so if your balayeuse is seen, it will be assumed that it’s part of your petticoat. 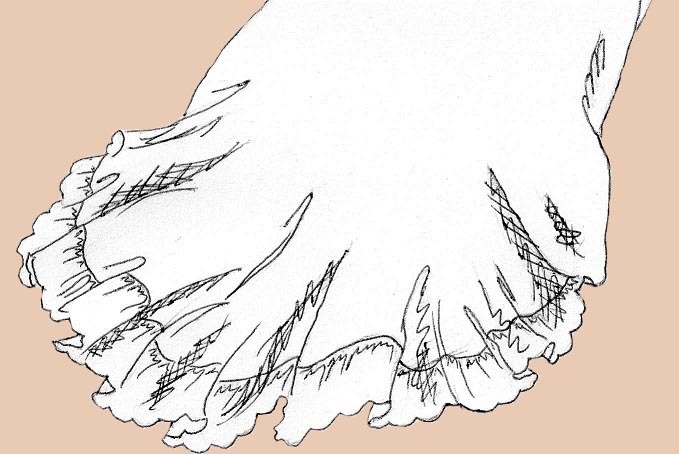 Who can resist the sensual allure of a glimpse of petticoat beneath the hem of a skirt? Another aspect to consider is the color of your gown. A lighter gown will look better with a white balayeuse, while a dark gown might look better with a black one. 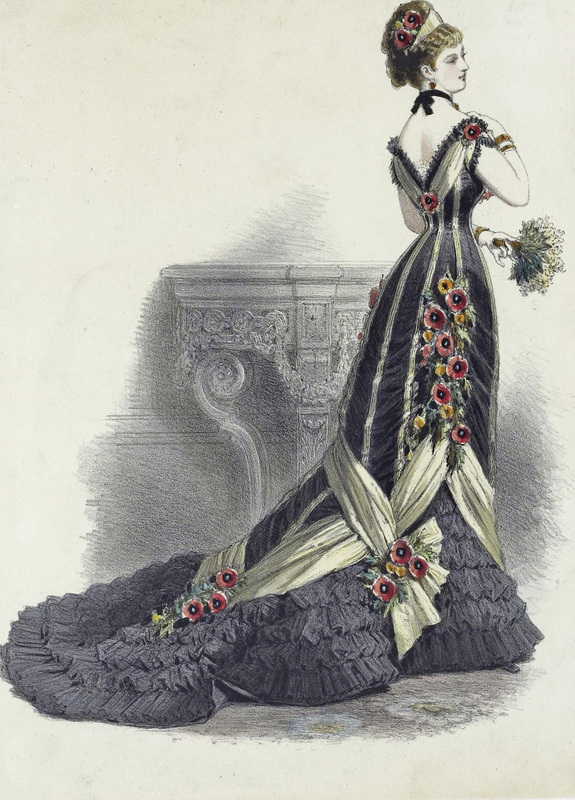 Of course, any gown will look good with a matching balayeuse, but consider the nature of your fabric. You might not want a dust ruffle made of fragile silk, for example. Lace or fabric? You can make your balayeuse out of either. Fabric is eminently more practical, being sturdier and easier to clean. 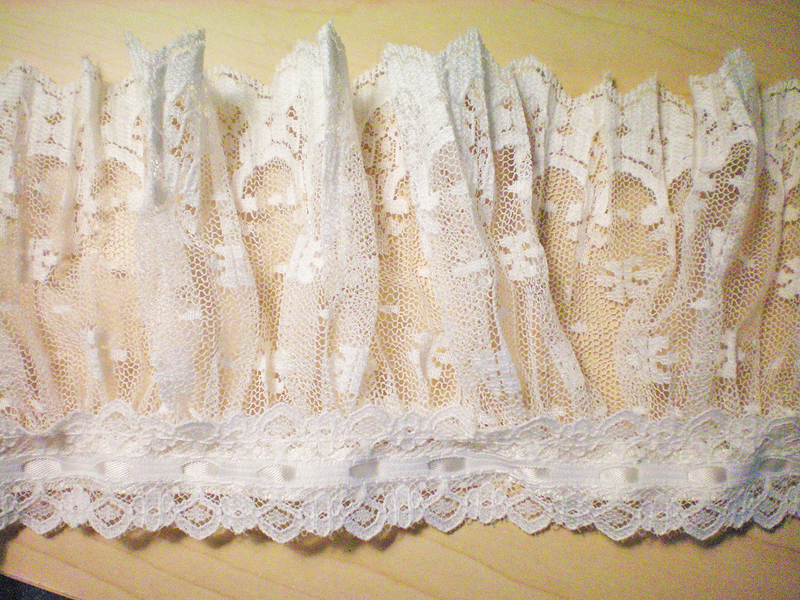 On the other hand, lace is gorgeous and displays an abundance of taste. Do you want it to be practical or sinfully pretty? The choice is yours. You can always compromise and use eyelet, which has the advantage of being both hardy and decorative. Pre-gathered eyelet or lace has the benefit of being easier to use. It also requires less yardage, since it’s already been gathered. The downside is that it’s typically gathered with less material than you might desire. Whatever you do, be sure and tailor your balayeuse’s material to your gown: while a ballgown might look stunning with a gathered lace ruffle, that same lace wouldn’t look right on a plain afternoon dress. Decide if you want your ruffle to extend all the way around your skirt, or just across the back. Measure around the inside hem of your gown to determine the finished length. Think about whether you prefer a tightly gathered ruffle or a softer look; use twice the length for a less-gathered look and thrice the length for fuller gathers. Next, choose how wide you want your ruffle to be. Six inches is a good width to start with. If you want a layered balayeuse, you might make the top ruffle narrower than the one underneath. For this demonstration, we’ll stick with a single 6″ ruffle. If you’re using fabric, cut a length of muslin or broadcloth long enough to gather to your skirt hem and seven inches wide. 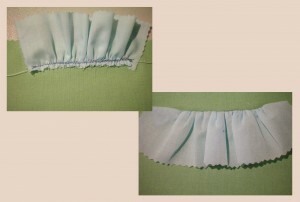 For a half-ruffle, you can taper it so that the ends don’t stop abruptly but gradually vanish. 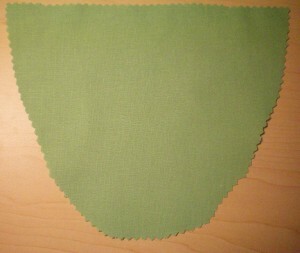 Finish the bottom with a simple hem: turn the edge under 1/4 inch, then another 1/4 inch, and stitch. Gather the top edge. Method #1: Lay a narrow cord along the edge, secure one end, and carefully zig-zag over it. Pull the cord to gather the ruffle. Method #2: Loosen the tension on your machine and stitch two rows 1/4” apart. For a very long row, break the rows into segments no longer than 18”. Back-stitch at the beginning of each row, to secure the stitching. Gently pull the bobbin thread to gather the fabric. Ease the gathers along the thread until they are even and neat. Secure the gathers by stitching to a stay—a length of twill tape works well, as does a cut-off selvedge, or grosgrain ribbon. Method #3: By hand, sew a running stitch along the edge of your fabric. 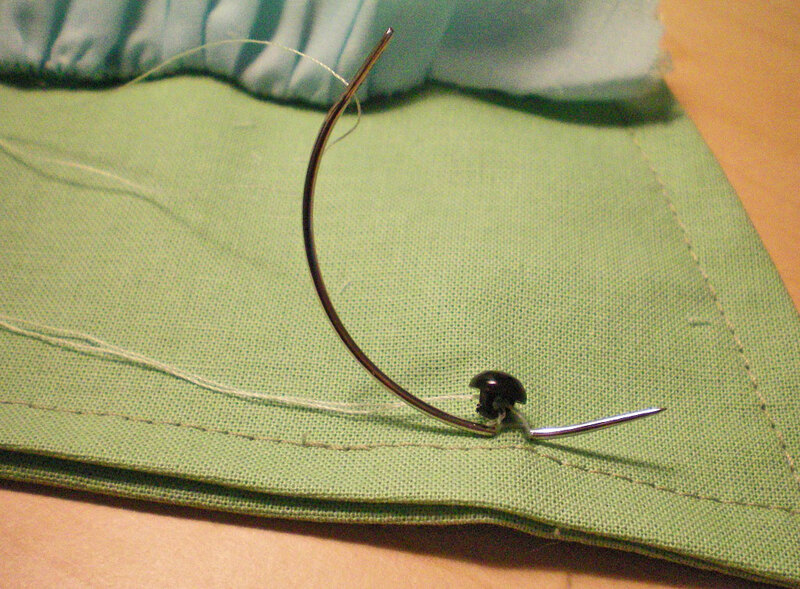 Secure the thread first by back-stitching. Keep the stitches straight and even. Every so often, pull the fabric along the thread to gather it. Continue until you near the end of your thread. Back-stitch again, and knot your thread securely. 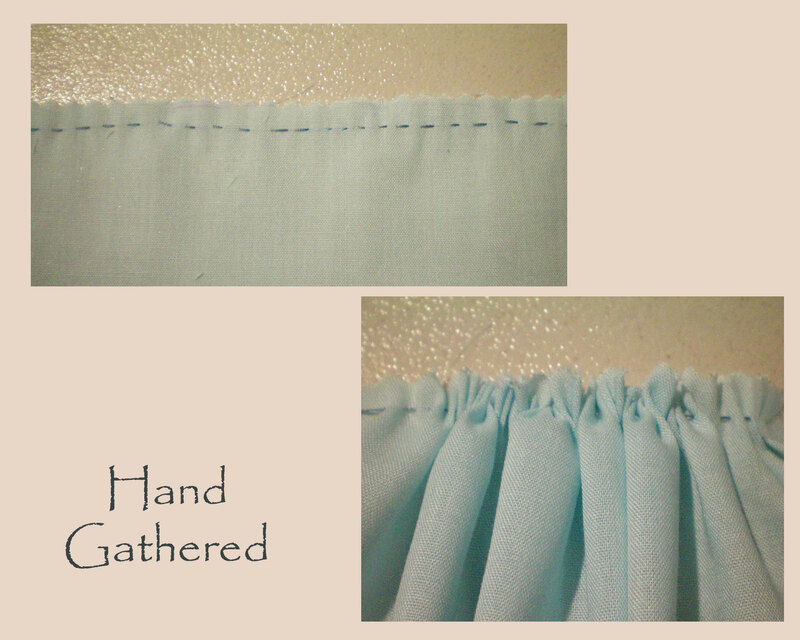 Repeat until the entire length of ruffle is gathered. Alternatively, hem both edges, gather it about an inch from the top edge, and then cover your gathering stitches with narrow twill tape or a ribbon. 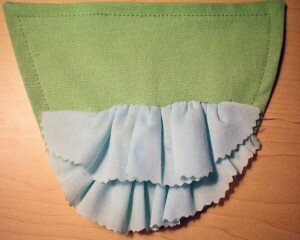 In this way, you can stitch the ruffle directly to the lining without worrying about flipping it first. Use short basting stitches (between 1/4″ and 1/2″ in length) so that it will be easy to remove for cleaning. For the second type of balayeuse, you’ll need at least a yard of thin muslin or broadcloth for your base, depending on the size of your train. If you’re making an evening gown, you might try silk habotai instead of muslin. Lay out the back pieces of your skirt pattern and trace the lower half. You’ll want to include the entire train—everything that might touch the ground. Generally, this will result in a half-circle or cut-off oval panel. 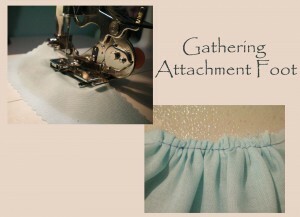 You may need to piece the fabric together, matching the seams of your skirt. If you like, you can taper the ends for a more elegant crescent shape. Trim the hem allowance off and add a 1/2″ seam allowance to the edges. This should result in the panel ending 1/2″ from the hem of your skirt. Once you know the shape you need, cut out two layers of fabric. If you need to piece the fabric together, do so now. Add a 1” strip of lightweight interfacing 1/2” from the edges of the top layer—this will provide stabilization for the fastenings. 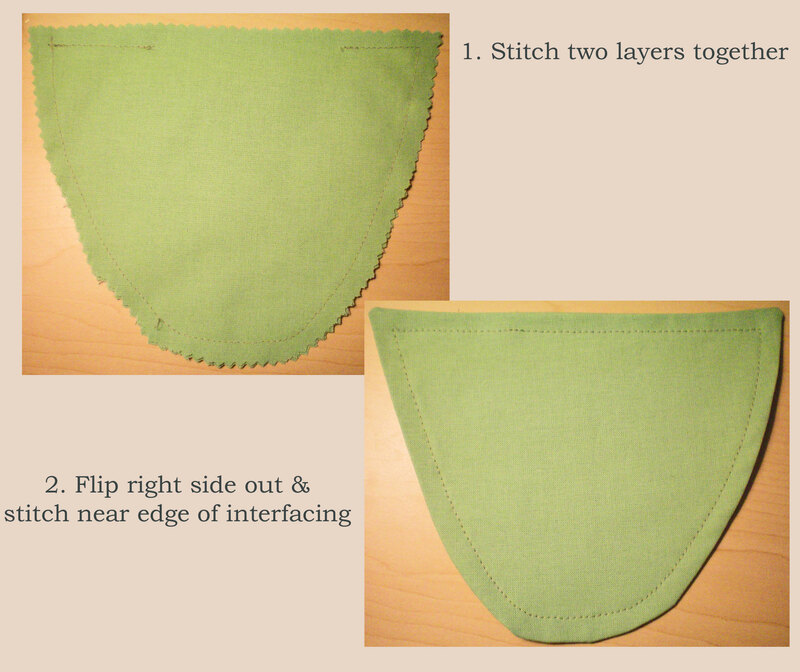 With right sides together, sew the layers together around the outer edge, leaving the top free. Fold the top edges in and slip-stitch by hand. Machine stitch along the edge of the interfacing to reinforce it. If you’re in a hurry, you may add Velcro or ribbon ties at intervals around the edges, but the better option is to button the balayeuse in place. Sew small or medium-sized buttons to the hem of your skirt, with matching buttonholes around the edge of your balayeuse. The upper edge, however, will require some tricky maneuvering to prevent the buttons’ stitches from showing. If you’re good at planning ahead, sew the buttons to your lining before you hem your skirt and lining together. If it’s too late, you have a few options. First, you may reverse things and hand sew buttonholes onto the skirt lining and attach your buttons onto the balayeuse. Your second option—though quite historically inaccurate—is to tack squares of Velcro to your skirt lining and balayeuse. Barring that, your third option is to sew ties to both your lining and balayeuse panel, using grosgrain ribbon or narrow twill tape. This will be difficult, as you’ll have to sew just through the lining and not your skirt. You might try using a curved needle to accomplish this, or glue them if you’re not concerned with accuracy. Just be careful that the glue doesn’t seep through your lining and onto your skirt! Your fourth option—and by far the easiest—is to use a curved needle to sew ball buttons onto your balayeuse. Make your buttonholes small enough that the ball button will barely fit through and won’t easily pop back out due to the weight of the balayeuse pulling on it. In order for your balayeuse to support your train, you’ll need to cover the panel with several rows of wide ruffles. You can make these of lace or washable fabric, such as muslin or broadcloth. Measure the width of your panel and cut your fabric two or three times the length you need, depending on how full you want your ruffles to be. 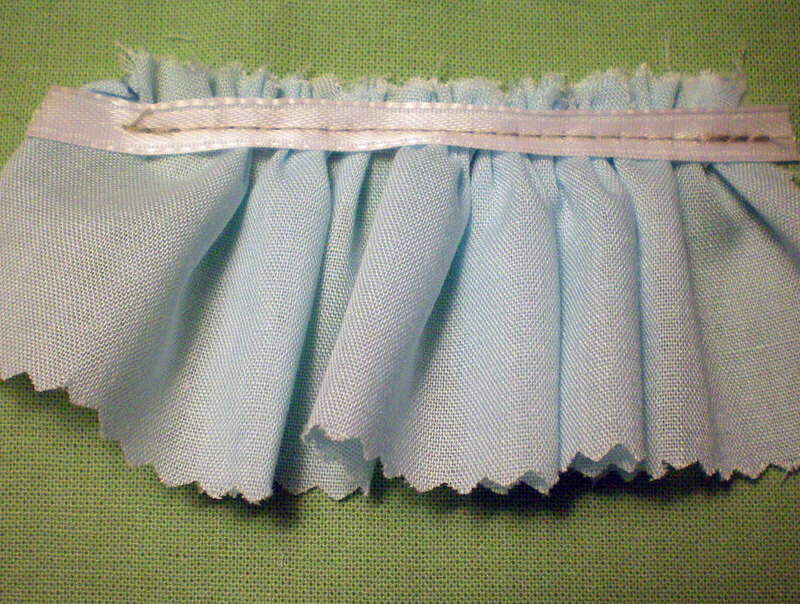 Cut your fabric twice as wide as necessary: for 6″ ruffles, cut your fabric 12″ wide. Fold in half, press, then gather the upper raw edge until the fabric is the right length to fit across your panel. Stitch the ruffles directly to the base panel. Be sure to overlap each ruffle, so that the hem of one covers the raw edge of the one beneath it. The uppermost ruffle should either have the top edge finished, or be stitched upside down, so that it will flip over to hide the raw edge. Align the bottom ruffle so that it ends just beyond the edge of the panel. You may choose to edge it with a narrow lace, just in case it shows. Button it in place, and you have a finished balayeuse! Have you ever sewn a balayeuse? Which method did you use: paneled or flounced? Did your balayeuse work as intended? This is most enjoyable. I always wondered how and who kept these beautiful gowns and dresses from becoming filthy. Now I know. Brings a smile to my face and a lift to my heart. Love reading your posts and blog. Looking forward to much more. I have never made an historical exact costume, but just might get the courage to try now. I’m glad you’re enjoying the website! I hope you do find the courage to sew a historical costume someday. It’s such a delight to do the research, design the gown, buy the fabrics and trims, and then watch the costume come to life, bit by bit, as you sew it together. It’s always inspiring for me. Have fun with it! Thank you for all the information. I am a visual learner, so pictures are always a blessing! I do have a question. On the pictures of the green fabric, you attached buttons. Do those buttons connect to the petticoat? I will be making one of these, but I do not have the petticoat with which to work, so I am wanting to attach directly to the skirt. I can see putting the buttons on the skirt and button holes on the balayeuse. Do you have a recommendation as to spacing for the buttons? Also, the ruffles go to the topside? If the ruffles go to the top, then do I only attach at the straight edge? Thank you for any and all help you can give! If the dress will be worn with a trained petticoat, then the balayeuse should attach to the petticoat. If a regular (untrained) petticoat will be worn with the dress, then you’ll need to attach the balayeuse directly to the skirt lining. I would space the buttons fairly close together, just to make sure the balayeuse doesn’t come loose. Perhaps every 3-4 inches? As for the ruffles, they go face-down. (The drawings show the skirt flipped inside out.) The ruffles’ purpose is to catch the dust, which won’t happen if they’re on top. I know, it’s sickening to think of your beautiful dust ruffle getting filthy, but at least you can remove it and wash it, which is more difficult to do with your trained skirt. Sorry, I’m not sure what you mean by attaching only at the straight edge. 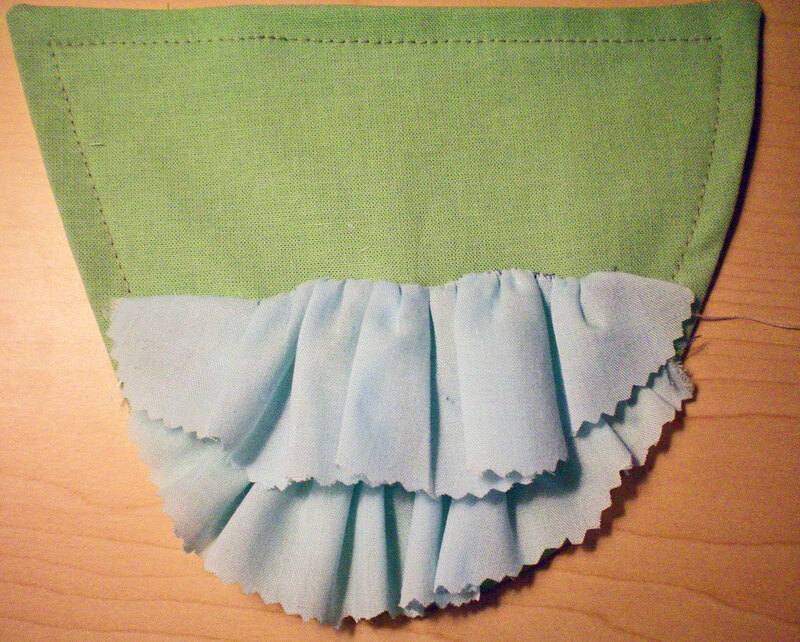 If you’re making a ruffle balayeuse, it attaches all the way around the inside hem of the skirt, high enough that it won’t show, but low enough that it will still touch the ground and protect the train. If you’re making a paneled balayeuse, the ruffles tier down the length of the panel. I hope I’ve answered your questions! Please feel free to send me a message if you need more help. The “ruffles down” answers the connecting on the straight edge question. This is such a fabulous tutorial! I’ve been trying to find a good breakdown on how a balayeuse works and is constructed. Off to make one now! Thank you! I’m glad you found the tutorial useful! Thanks for dropping by and commenting. Thank you. I am currently making one for a new gown. My question would be.. If the petticoat hem I am buttoning my balayeuse to is off the ground will it cause the balayeuse to crumpling onto it’s self? I have starched it and that helps keep it flat. Perhaps I am misunderstanding your question, but you only need a balayeuse for a trained skirt or petticoat. 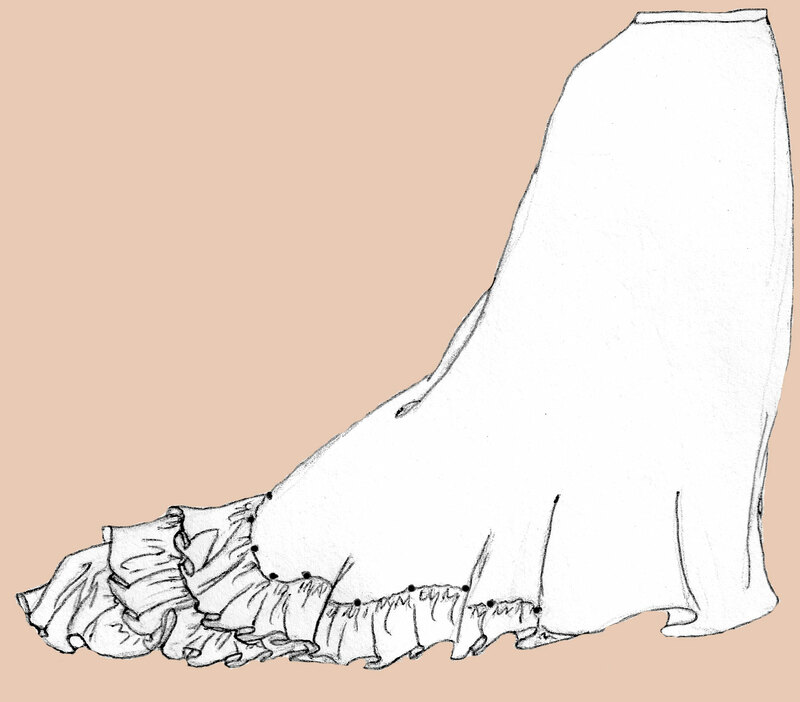 If your petticoat is off the ground, (which I assume means it’s not trained?) then it isn’t going to do any good to fasten a balayeuse to it. 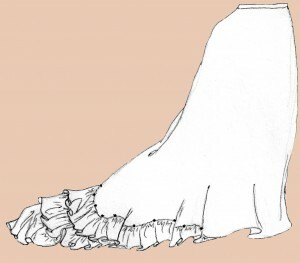 You want the balayeuse to be underneath a petticoat or skirt that lies on the ground in the back, because its purpose is to drag under the skirt hem, protecting it from getting dirty. It simply won’t work, otherwise. It is interesting to find an actual name for the dust ruffle. For my recent wedding, I added a ecru tulle ruffle to the underside of my skirt, since I would be dealing with snow, ice and dust. Worked beautifully. It definitely makes sense to make something that could be removed for washing or be replaced for a new look or replace. I’m surprised not to see this used for more trained formal gowns. 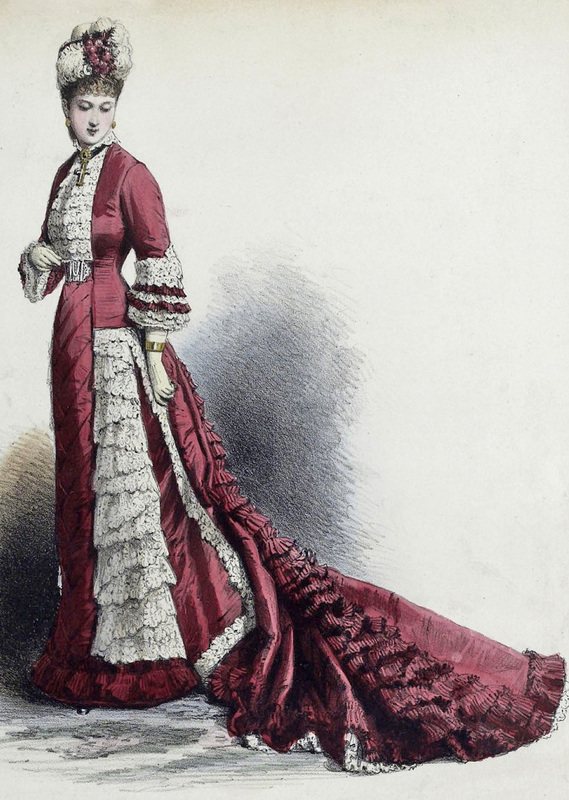 I did something similar for my first Victorian gown, before I knew what a balayeuse was. I bought several yards of pre-gathered ruffles and tacked them to the underside of the train, so it wouldn’t get dirty. I, too, am surprised they don’t use dust ruffles on modern trained gowns. It certainly would be a help! He was entirely right. This submit truly made my day. You cann’t imagine simply how so much time I had spent for this info! I am so glad I found your site. I wasn’t going to make a trained skirt but I really wanted one. I was worried about walking around Bourbon Street in New Orleans with a trained skirt (very dirty street in so many ways, LOL). Now with this I can have a trained skirt. I will be making it this weekend. I am making a Steampunk Witch outfit for the NOLA Witches’ Ball. Can’t wait to finish. So excited now that I can have a train. Now just to get my husband to not step on it. I wear 25 yard gypsy skirts to renaissance festivals and he is always stepping on them and almost pulling them off of me! Wish me luck with that! Sorry for the delay in approving your comment–it didn’t notify me, for some reason! I hope you have fun making your balayeuse! Wonderful article! Thank you so much for your research and engaging writing style. I found a picture on a vintage website (http://www.antiquedress.com/item11117.htm) that shows perhaps a modern version on one of Givenchy’s stellar gowns for Audrey Hepburn. What an interesting photo! It’s hard to tell if that’s a balayeuse or just a design detail, but either way, it’s lovely. Thanks for your comment! Sorry for being so late for the party, but do you have a source for the fashion plate you first show? Am wanting to recreate that gown and can’t find an attributed version with a description of the gown. Am pretty sure it’s French due to the poppies. And yes, I intend to make a balayeuse, plus TV125 petticoat with train extension. I figure the combination of 3 supports would give the support behind the knees needed for the look. Just a random person nearly a year later popping in to say I can’t be of much help other than to point you towards the book “Costume” by James Laver, google tells me that plate appears as the cover of the book’s first (1963) edition, so if you can track down a copy somehow, you’ll likely find your answer.